I picked up a couple packages of these Malayasian snacks in a Vietnamese grocery in Milwaukee, fully expecting to be grossed out or at least underwhelmed by some artificially flavored chipsimile. 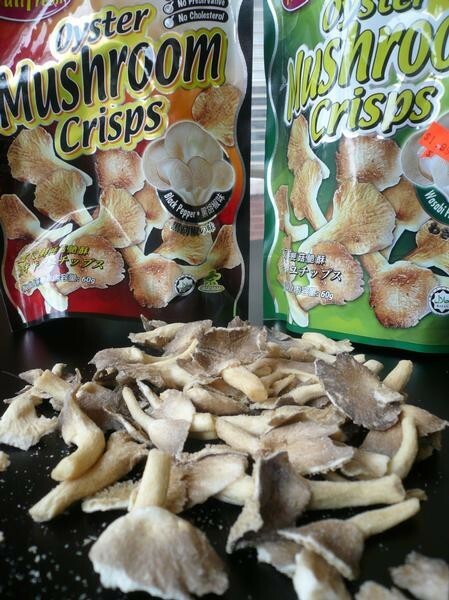 Turns out they're real mushrooms--not the kind you reconstitute in liquid, more like those freeze-dried vegetable snacks you find in Whole Foods. At first they were somewhat repellent, with a texture reminiscent of dirt, but gradually the mildly sweet, earthy flavor and the texture of the stems--which reminds me of one of those Lorna Doone shortbread cookies--won me over. The black-pepper-flavor ones have a nice kick, stronger than the wasabi, which are far milder than those sinus-scouring snack peas. If you see these around town anywhere, $2 a bag isn't a bad gamble.